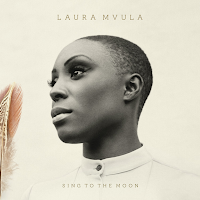 There has been no shortage of praise among music critics for Laura Mvula's recently released debut album, Sing to the Moon. The classically-trained British soul and jazz singer has scooped up plenty of critical acclaim for her highly stylized gospeldelic sound. Filled with intensely layered doo-wop harmony, time changes and highly unusual compositions, the songs on Sing to the Moon are certainly distinctive, but they can sometimes be a challenging listen. There is no denying the beauty of Mvula's versatile voice and the unique composition of her songs, but personally I found much of the music on the album to be either draggy or grating. Though comparisons to icons like Nina Simone are certainly valid, it's bands like Tune-Yards (who I like in small doses) and The Dirty Projectors (who I cannot tolerate), that spring immediately to my mind, thanks to Mvula's liberal use of time change and melody interruption. The more upbeat tracks like the finger-snapping gem Green Garden, That's Alright and Flying Without You (which breaks down into a horn-filled extravaganza) were lively enough to allow me to appreciate the unusual structure while still being pacified by a steady beat. I wish there had been more songs like that on Sing to the Moon. Sing to the Moon is not for everybody and it certainly isn't a comfortable album for people who, like myself, are irritated by discordant structure. But I would encourage anyone to listen and decide for yourself if it speaks to you. I don't know this music (yet) but let me just offer up 3 cheers for people who are making any music that is not for everybody, even if it's quirky or difficult or lumpy or whatever (even if I personally don't like it). I'm glad to see it recorded and happy to see it have an audience! My sentiments exactly, Eugene, and said much more eloquently than I could. Oh I do love this album, despite the observations you have made. It is not perfect, but it is refreshing to me. I actually sought her out due to hearing her song in a commercial during Wimbledon coverage, of all things. I am thrilled to hear that, Missy, because I really do think this is a unique and worthy album. It's not for me, but that doesn't take anything away from it.